Another boring tight range day on FKLI, with its seemingly never-ending consolidation....Oh wait, maybe it does have an end to it, & it may happen as soon as tomorrow?! 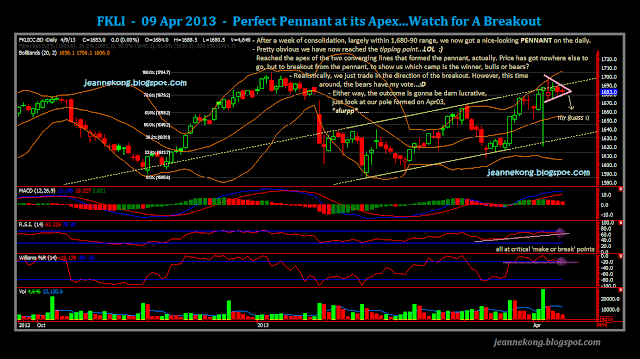 Its the chart telling me that the consolidation after the Apr03 super-dragonfly may well be coming to an end. The clue lies in the Pennant pattern formed on the daily. After about a week of consolidation, the daily candles has been squeezing towards the apex of the pennant. Today's candle took up the last few inches of space right near to the apex. I'm anticipating a strong breakout from the pennant, most probably to the downside (I'm bearish bias), as signaled by the weakness shown on lower time-frames. However, if we see it from the pattern's characteristics, Pennants mostly leads to trend continuation, less so as reversals. So, we'll have to keep that in mind, & also prepared for a possible upside breakout to continue previous strong rally. CPO gapped up to open at 2,418, touch 2,419 day high & consolidated the whole morning session. Afternoon open saw sellers took over & push price down to 2,392 in a flurry of selling. 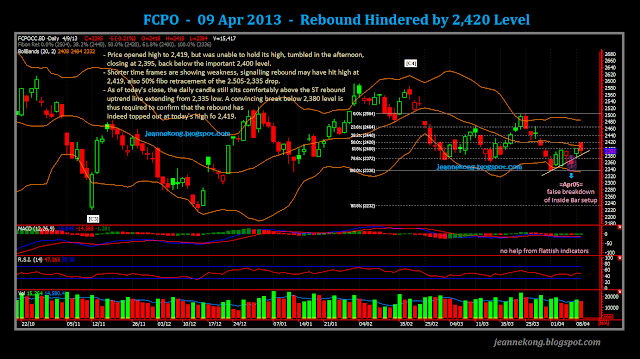 Further drop to day low of 2,384, before buyers bargain hunt & bring price higher to close at 2,395. The day's close below the important 2,400 level, together with a failed attempt at the 2,420 resistance, spelled weakness of the rebound, which seemed strong the previous day when price closed high at 2,400. Lower time-frames has been showing signs of weakness ever since price failed to challenge the 2,420 level after its high open. Nevertheless, the daily candle still sits nicely above the ST rebound uptrend line, one last hope for the bulls to bring the rebound higher, amid much obvious weaknesses. Price has actually V-shaped up from last week's low of 48.30, to current level of 49.50, within 2 trading sessions. Pretty bullish price movement there, but do note that 49.50 is itself a minor resistance level, besides the overhead 50cents strong barrier. We'll have to see if overnight action could bring price over the 49.50 resistance, towards 50cents level. If that does happen, we might see CPO bulls come back for a respite tomorrow. Or, price may also succumb to selling & fall back to 49.00-49.20 support band, or further to find 49cents level. MPOB March stocks level & export figures, due out on Apr10 (Wed). FOMC Minute, due Apr10 (Wed) at 1400 EST. MPOB data for March'13 is due out today Apr10. Not tomorrow as I mentioned in the my post earlier. Has been corrected. Please note.